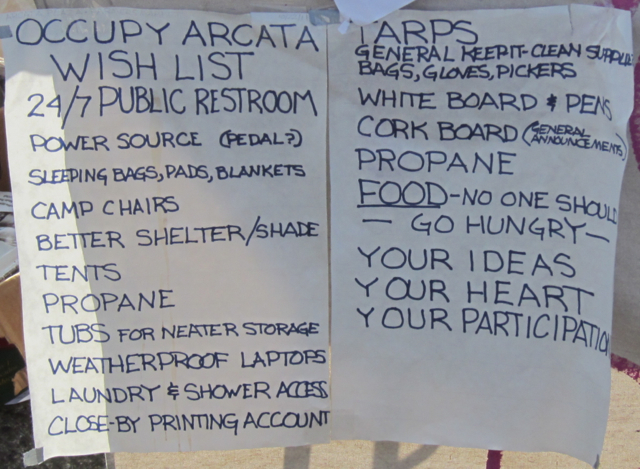 PLAZA – The City of Arcata has formally notified Occupy Arcata that the temporary living quarters on the Plaza will have to go. Some 14 tents and a few cardboard micro-shanties crowded the Plaza’s center the late afternoon of Oct. 26, when written notice was served by Police Chief Tom Chapman. The City letter states the City’s support for the constitutional right of peaceful assembly, and leverages the same principle to compel compliance. It states that the various structures interfere with the rights of other to freely use the Plaza, and asks that “all tarps, tents and structures” immediately be removed. “Despite warnings from the police department, your group has continued to encroach on the rights of other people to assemble in the public space that is intended to be open for EVERYONE!” the letter says. 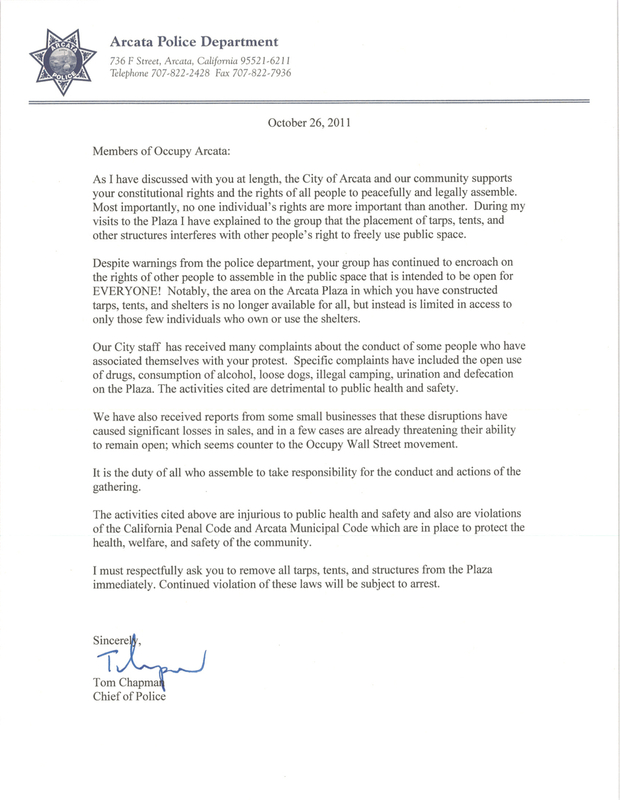 Signed by Chapman but developed with top city staff and the city attorney, the letter echoes what has become an ever-hotter topic among downtowners for the last few days – the sudden emergence of a campground and perpetual party on the Plaza, in which virtually every rule for the park’s use has been thrown overboard. The City letter cites instances of unacceptable public behavior, including open drug use, alcohol drinking, loose dogs, illegal camping, urination and defecation. Chapman hand-delivered copies of the letter to activist Lois Cordova, one of the core Occupy Arcata organizers. Just two days after a major confrontation with police, only a half-dozen or so of the protesters seemed interested in the pivotal law enforcement directive. It was dinnertime, and most of the people inhabiting the Plaza were busy preparing their shelters, making food, talking and generally lazing in the low sun. Cordova expressed frustration about the drinkers and dopers. She said they upset the public and wrongly bring discredit to the Occupy Arcata movement. One protester suggested that activist participants – those who are there to effect societal change rather than hang out, eat the free food and party – wear arm bands identifying themselves. The protesters had issues of their own. They said some citizens had yelled at them and called them “you people.” Multiple complaints centered on alleged rude treatment and harassment by police officers. Several made the point that a public restroom would make some of the problems go away. Cordova said the mid-Plaza camp had been rotten-egged during the previous night. Several of the protesters wished to engage Chapman in discussions of political and philosophic matters over which the Arcata Police Department has little jurisdiction. Chapman, Cordova and several other of the more alert protesters discussed the letter and initial remedial steps amicably and at length. Several said they would try to curb the excesses of the less disciplined slacktivists. Chapman said there was no specific deadline for removing the tents and curbing the inappropriate public behavior, but that he hoped to get things moving in the right direction with a scale-back of the burgeoning camp. 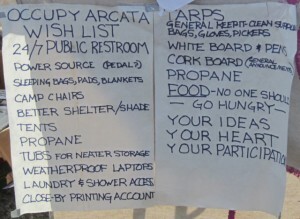 Liberal Arcatans sympathetic to the Occupy Wall Street uprising have found themselves appalled at the degradation of the Arcata Plaza into an anything-goes hangout. 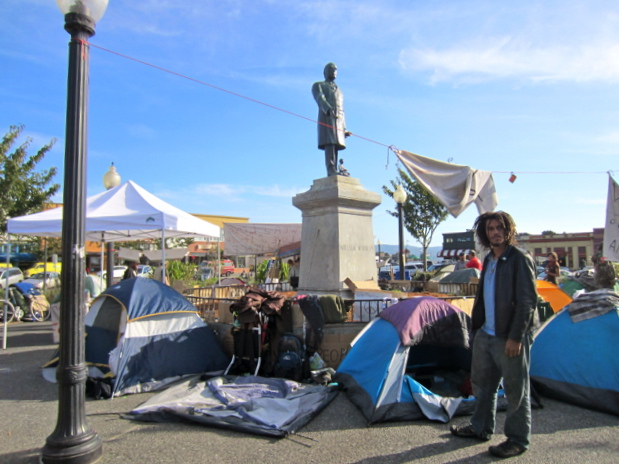 Online and on the streets, downtowners well-accustomed to Plaza weirdness have found themselves in a state of cognitive dissonance mingled with fascination and disgust over the Occupy Arcata phenomenon. Many question how the unfocused Plaza protest promotes progressive values, or whether it has the opposite effect. 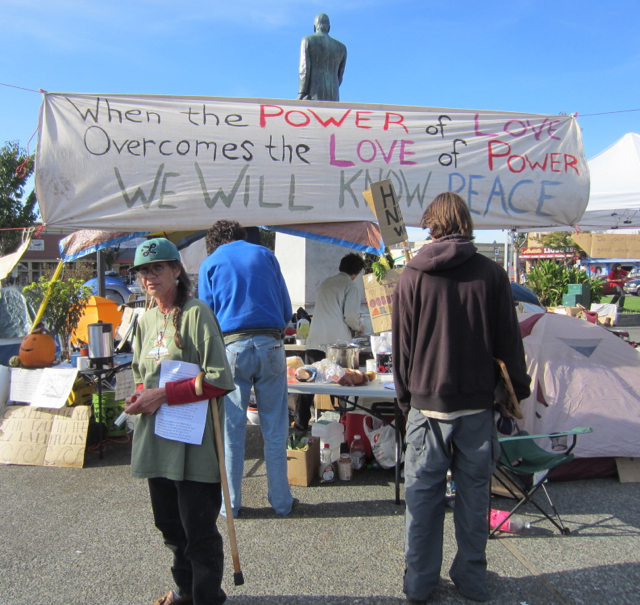 She suggested that Occupy Arcata follow Occupy Wall Street’s “Good Neighbor Policy,” Others have compared the OA party zone to the well-kept, vibrant Occupy Humboldt camp at Humboldt State, and found the Plaza version lacking. Another question is what will happen at Saturday’s Farmers’ Market. The North Coast Growers’ Association has a permit to use the Plaza, the center of which is used for food vendors and a band. Last week the OA installation moved over to the Plaza’s southeast corner, but it was a fraction of its current size. Some of the current campers appear to be dug in, both physically and in terms of attitude. Queen Doubles food vendor Jada Brotman has been all but put out of business by the encampment. Wednesday she set up on the Plaza’s north side to get away from the rough crowd and closer to any customers who might still brave the Plaza’s periphery. Supporters and fans of the independent businesswoman’s unique Trinidadian chickpea tacos have pleaded with Facebook friends to patronize her struggling food cart. Occupy Arcata founder Trish Tillotson was away on family business today. She said she wasn’t concerned with the growing criticism offered online. “I’m staying away from the hype,” she said. Tillotson said she’s been making progress in addressing Plaza businesspeople’s concerns by engaging them one on one. “I feel like it’s moving in a positive direction,” she said. One APD officer who was out on the Plaza as Chapman negotiated with protesters lamented that small, local businesses were suffering from a protest which ostensibly targets the “one percent” wealthy elite. “They don’t realize, we’re the 99 percent too,” the officer said. This entry was posted on Wednesday, October 26th, 2011 at 9:13 pm	and is filed under News, Community. You can follow any responses to this entry through the RSS 2.0 feed.